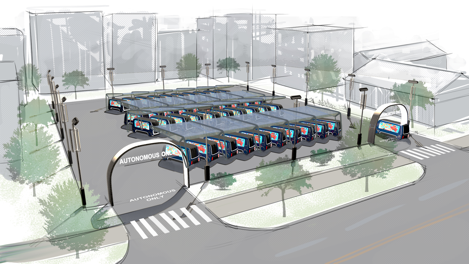 The On-Demand Autonomous Convenience Store vehicle and Autonomous Consumer Fleet of the future will shake the very foundation of the Fuel Retail & Convenience industry as we know it today. 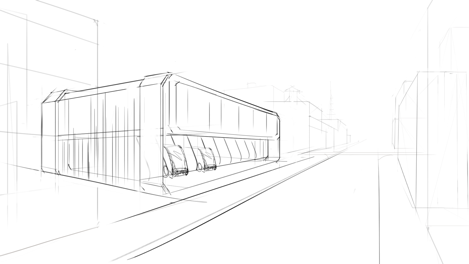 In this concept, convenience comes to the consumer, whenever, wherever they are. Cars are no longer owned or leased by consumers. 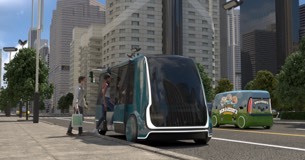 Transportation is offered as a subscription service to autonomous fleets. 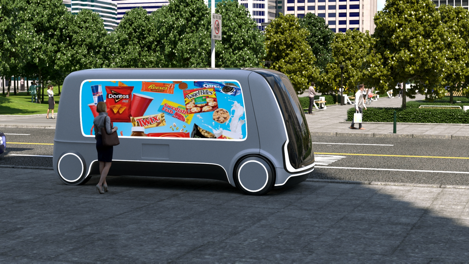 The driverless convenience store carries a variety of products including typical CPG items, snacks, sandwiches, salads beverages, and other popular categories. 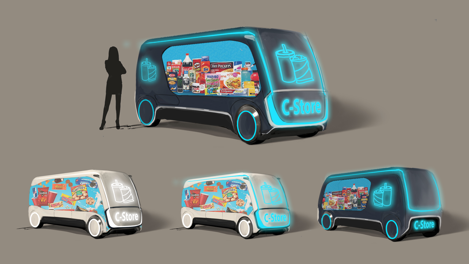 Consumers can order the ‘convenience store on wheels’ from anywhere get their products delivered within minutes. The driverless CPG store carries products specific to a brand or family of brands. Consumers can order their favorite products from their favorite brands from anywhere and get them delivered within minutes. Consumers order-ahead from a device of their choice and get their products delivered at any hour of the day or night to the location of their preference. 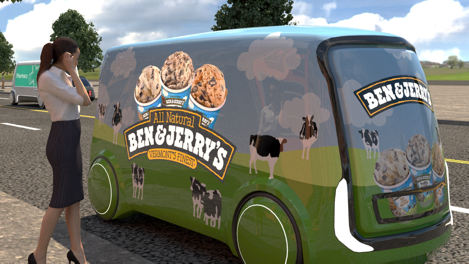 Delivery happens in near real-time as convenience EVs are already on the road and in constant transit between order drop-offs, replenishment, and recharging. If a vehicle is not in transit for product delivery, consumers can hail the EV store, similar to how consumers used to hail a taxi (in days prior to Uber, Lyft, etc.). The EV store detects when a consumer is hailing and will safely pull over to take the consumer’s order via touchscreen displays on the vehicle. Digital Displays on the EV stores personalize offers based on consumers’ previous shopping behavior and make predictive recommendations for what the consumer is likely to purchase. Built-in facial biometric recognition makes authentication and transaction frictionless. On-demand ridesharing services work like the current Uber or Lyft model where rides are requested on demand. 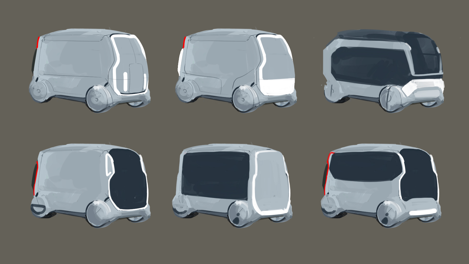 The vehicles are completely autonomous. 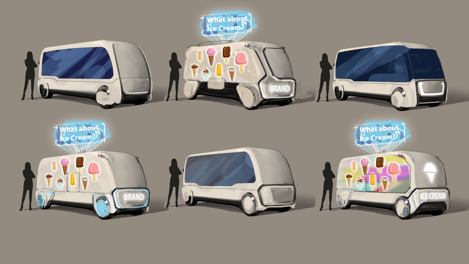 Savings made by the autonomous fleet by not needing a driver are passed along to the consumer. Ridesharing services become economically viable for all consumers. Subscription ridesharing allows consumers to link their calendars so that a vehicle automatically picks them up at a time of their choice to get work or to get to meetings. Savings made by the autonomous fleet by not needing a driver are passed along to the consumer. Subscription Ridesharing becomes economically viable for all consumers. 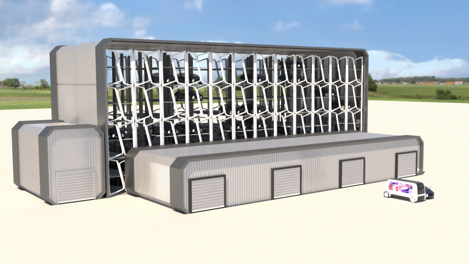 Centralized warehouses are spread throughout a region to ensure quick replenishment of EV stores and expeditious delivery. 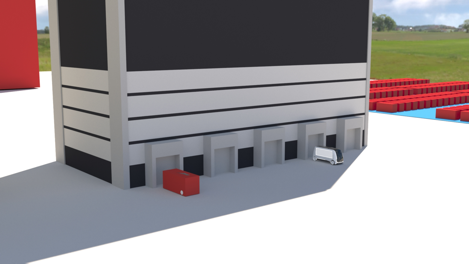 The warehouses are located in inexpensive areas to keep cost of rent and operation low. Centralized parking facilities are spread throughout a region. 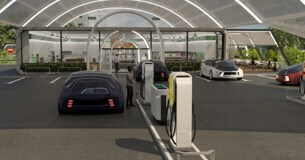 EVs return to those central facilities to recharge or park if they are not in use. 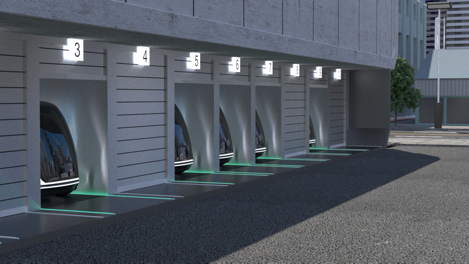 Automated cleaning stations ensure the vehicles are clean from the inside and outside before they get back to work. Contact us for a Future Vision Briefing to explore how digital transformation and industry disruption will shape the future of your brand.